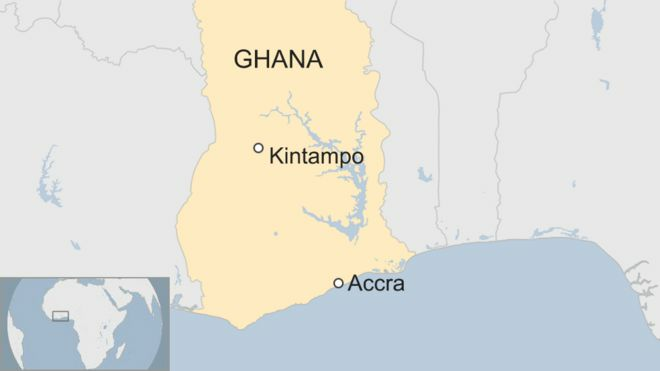 Up to 20 people have died and many have been injured after a large tree fell on them at a popular waterfall spot in Kintampo, Ghana. They were swimming during a storm when the freak accident happened, emergency officials said. The tree had seemingly been brought down by the storm. Ghana National Fire Service spokesman Prince Billy Anaglate said the incident happened at the Kintampo waterfalls in the Brong-Ahafo region. A combined team of police and fire service personnel attended the accident site, in a bid to rescue those trapped by the tree. “A huge tree fell at the top when the rains began and crashed the revellers,” an eyewitness told Ghana’s Starr News. Fire Service spokesman Mr Anaglate told AFP that 18 students had died at the scene, while two others died in hospital. He said 11 people were receiving treatment, including one of the school administrators in charge of the trip. Other reports put the number of injured at over 20. They are being treated at the Kintampo Municipal hospital. “We extend our condolences to the families of the dead and pray for the injured,” Ghana’s tourism minister Catherine Abelema Afeku said in a statement.